The Target Saver: Target: Extra Gum Single Packs - 25¢ each! 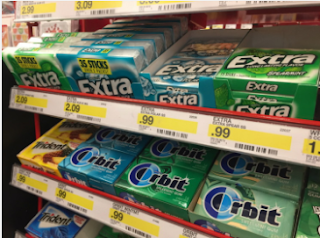 Target: Extra Gum Single Packs - 25¢ each! Today I found there is a new high-value 50% off Cartwheel offer for Extra Gum single packs at Target. Combine the Cartwheel offer with a $0.50/2 manufacturer coupon from the 1/7 Red Plum newspaper insert. Pay just $0.25 each when you buy two packs!